Time sure does fly, doesn’t it? Feels like just the other day PAX Aus was ending…………. oh wait. We hope everyone attending PAX Aus had an awesome time, and we apologize that the PCD doesn’t have a huge presence there (YET!) but that you still had a blast. With that being said, the second-ever PAX Unplugged will be going down in exactly one month from today! With that, we have some a just a few things we’d like to go over. 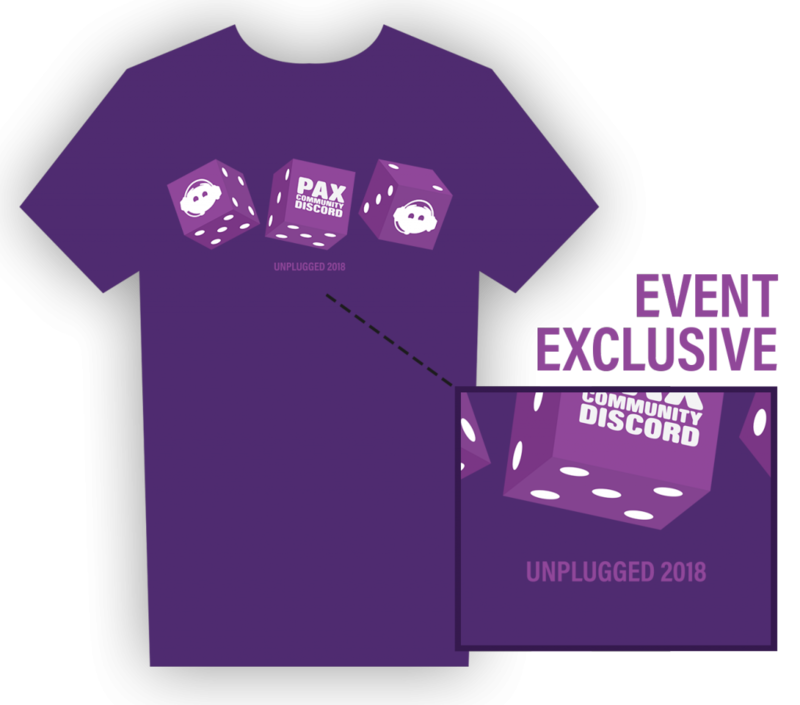 To continue the trend we started at West this year, we have some exclusive PAX Unplugged 2018 shirts for anyone and everyone to get their hands on! They’re available via the merch section of our site for $20. We hope you like them! Starting with South, we’ll be taking some suggestions for shirts going forward (South, East, etc.) to see what sort of unique designs the community can brainstorm, then us designers can mush together a bunch and make something that’s (hopefully) visually appealing. Anyhow, below you can see the nifty design for the Unplugged ’18 shirts. These won’t ever show up again, so you’ll only have around a month or so to grab one. This year’s shirt designs (well, the two we’ve done) have been very flat, 2D, and simplistic. Not sure if we will stick with that or not, but it’s worked out pretty well so far. Definitely lots more we can explore, hence why we’ll start getting some community ideas soon! Anyways… that’s a lot of words about shirts. Mooooooving on. Also our classic PCD tees are only available for a couple more months (till the end of 2018), so if you’re interested in that, you can also find that in the merch section of the site. For those of you who ordered/reserved a pin and/or badge, we have some info for you regarding how to get your stuff. We tried a new system out at West this year that (for the most part) simplified things for everyone and made it a little more straightforward where you can get your stuff. Unplugged is much less hectic than West or East for now, so it should be even easier. Sometime in November, you’ll be added to a private category called “PCD Event Pickup”. Here, you’ll be able to see pings of where I’ll (gfx) be doing little meetups for members to grab their things. If you can’t make any of the meetups and you feel you might not have a chance to get your things otherwise, feel free to ping me within the discussion channel (within this private category) and we can work something out. This will go for people getting pins, paid supporter badges, or free community badges. We may have some extra free community badges lying around, so if you’re interested in one, DM me and I’ll be sure to add you to a queue for em. If you have any other questions regarding this process or anything else, don’t hesitate to ping either myself or Andeh in server. More info will come a bit further into November. That about sums up everything. If you still need PAX Unplugged badges, head over to this link right here. If you’re on the edge of your seat waiting for PAX East badges to go on sale, good luck to you. Thanks for being an awesome member of the PAX Community Discord! Your continued support means a lot to us, and without it, none of this sort of stuff would be possible. <3 See you all in Philly.